I’m writing this on a Friday around lunch having just made two bowls of what you’re looking at above, one for me and one for Andy, who is working from home. I made it for him because he was like Remember the green beans and egg thing you made last time I was working from home? Damn that was good. And I was like I remember exactly what I made you, because I make it every single day and is that your way of asking me to make it for you again? 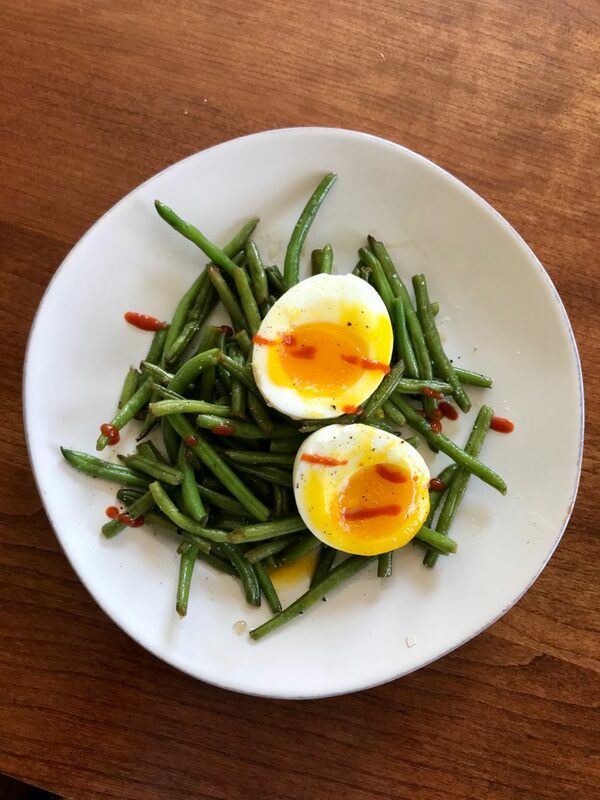 Like Beans on Toast and Breakfast Burritos, my “green beans and egg thing” is one of those no-recipe recipes that is so brain-numbingly basic, it feels a little like cheating that I’m even writing it up. But what I’ve learned about these kinds of recipes (specifically those Beans on Toast and Breakfast Burritos) is that they get a lot of readers over the years, something that should not be surprising considering all anyone ever asks for in this world are ideas for easy, delicious things to cook for dinner or otherwise. Or maybe it’s that they’re asking for permission to cook easy, delicious no-recipe type things for dinner. Either way, does it matter? My Beans and Eggs have not yet made it to the dinner table. It shines at lunch because I’m usually coming home from my office to have a quick bite and walk the dogs, and I want vegetables, but I don’t want to deal with preparing vegetables (washing lettuce, trimming carrots, chopping broccoli, etc), which strikes me exclusively as a dinner-making enterprise. Enter: Frozen Organic Green Beans. I’m not sure when I started picking them up in the freezer section of Whole Foods and wherever else, but I did, and can I just tell you how liberating it is to scoop a handful out of the bag, smoking with frost, then dumping them directly into my hot buttered skillet? For those of you scratching your heads at this, I should probably tell you that nostalgia is playing a huge role here. A few nights a week, my mom would do the same thing with the frozen rectangular block of Bird’s Eye “French Cut” beans, so when I toss them with melted butter and salt, I’m right back in my childhood mustard-linoleum kitchen. Trader Joe’s sells “Haricot Verts” (look for them in the clear plastic bags), which are reliably skinny and flavorful all year long, especially appreciated during these out-of-season months. Whole Foods sells the legit French-cut style, which basically means shaved and chopped, and makes them taste sweeter and better. I will not be taking follow up questions on this. Sometimes I stand at the counter reading twitter, eating my big bowl of salty buttered beans, and that’s enough. Most of the time I top them with a seven-minute egg. I’ve been known to add a dash of vinegar here, a drizzle of Sriracha there. If I’m feeling fancy, I’ll toss in some slivered almonds. If I have the energy I’ll chop an onion or shallot to the butter because how could that be bad? On the particular Friday when Andy requested this, I made my best version yet, splashing in some soy sauce and rice wine vinegar then hitting the whole thing with a shake of Furikake, an ingredient that was most certainly not in my mother’s 1980’s suburban kitchen. It was tasty — maybe even good enough to graduate to dinner. Heat onions, butter, and sesame oil in a skillet set over medium heat. After a minute or two, add beans and salt. It might take a while for them to thaw, but that’s fine, because you can use that time to prepare your seven-minute eggs (below). Once beans are heated through, remove to a bowl, then toss with vinegar and soy sauce. Top with egg (slice the egg when it’s in your bowl, otherwise it’s hard to transfer), Sriracha, and a few shakes of Furikake. Seven-minute egg instructions: Fill a medium pot with water about 2/3 of the way full, and bring to a boil. Reduce to an aggressive simmer and, using a slotted spoon, slowly lower your eggs into the water, releasing gently. Set your timer for exactly 7 minutes. (In previous posts, I’ve mentioned that I usually go 6:45 here, but recently, I’ve been favoring seven minutes exactly, to avoid any remote chance of runny whites.) While your eggs simmer, prepare a bowl of ice water and plunk the eggs directly in there once the timer goes off. Remove after a minute — the ice water stops the cooking, but if they’re in there too long they get cold, which I don’t like. Remove shell. I think I know the answer here, but is it 7 minutes of cook time for an egg straight from the refrigerator, or do you let it come to room temperature? I only ever do it straight from the refrigerator because that’s usually the mode I’m in. I’m sure timing is a little less for room temp eggs. Great idea, thanks! I recently discovered the virtues of frozen haricot verts and wonder what I’ve been doing so long! Fresh green beans are so unreliable, particularly when my husband does the shopping. I also bet this would be good with Trader Joes’ Everything But the Bagel seasoning too! You had me at “hot buttered pan”. Putting green beans on the grocery list! Green beans topped with soy sauce was always my favorite growing up and still one of those things that I love. This was our breakfast just now and wow! I love it. I think I might LIKE green beans (revelatory for me). I think I need to work on the timing of the eggs a bit…like, aggressive simmer must mean pretty good bubbles, right? Do you have to watch the water closely the first few times? At any rate, they were wonderful, soft, like-poached eggs. I was cooking four of them, so I added a couple of minutes to make them easier to peel. Thanks! Thank you for this! You inspired me to try soft-cooked eggs for the first time. I put them on top of a kale salad and they were delicious. 3 minutes in the Instant Pot on “steam” setting. Thank you for sharing the post. I tried the 7 minutes egg tip and it’s perfect. I feel like this would be fantastic with Spicy chili crisp…. We make this, on the reg, at our house. However, we usually put it on top of a baked sweet potato! I’m working from home today and remembered this post! Absolutely delicious–I used Trader Joe’s Everything but the Bagel seasoning and it was wonderful! Looks good to me, but my husband would wholeheartedly reject the idea that this could possibly be called lunch. This is one of my all time favorite lunches, but it has fallen by the wayside. Thanks for the reminder! Yes!!! Green beans with butter & salt!!! There’s nothing better. Must have been a 70’s thing. We had fresh and (eek!) canned “string beans” as my mom calls them. Nowadays, I stick to fresh or frozen, but I still get cravings for those canned beans every once in a while. Love the idea of adding eggs-perfect lunch. THANK YOU for thinking to write this up. A perfect little bare-pantry dish to restore some balance on a stressful day. I finally made this for lunch today after having it pinned since you posted. It was just the warm, easy, flavorful meal I needed during this cold spell! Absolutely delicious! Just had this for the lunch. Thanks for the recipe.